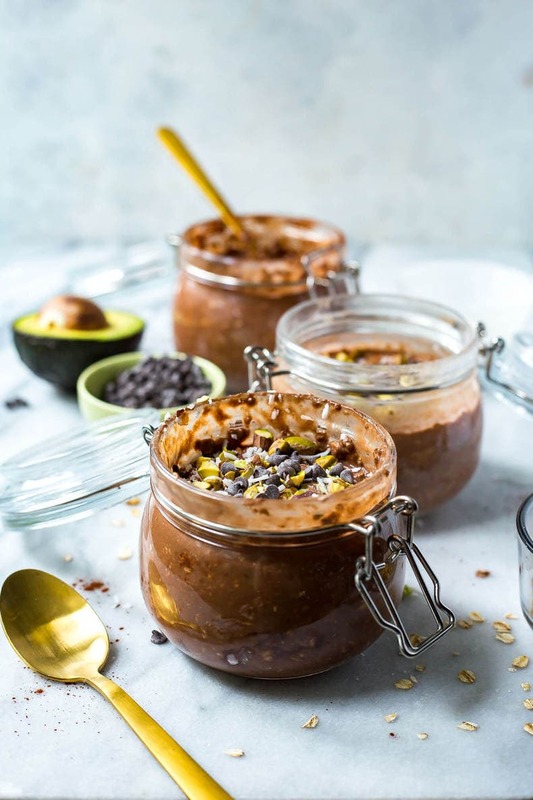 These Chocolate Avocado Overnight Oats Jars are so delicious and easy, you'll think that you're eating dessert for breakfast! Make these ahead of time for a quick and easy breakfast on the go! Oh breakfast, we meet again. It's no secret that I'm not a fan and that I like to make my breakfast ahead of time. I can't stand waking up and feeding myself first thing in the morning. I know it's supposedly good for the metabolism and blah blah blah to eat right away, but truth be told I just can't ever be bothered. Gimme breakfast ready to eat right out of the fridge and make it chocolate though and now you're talking! 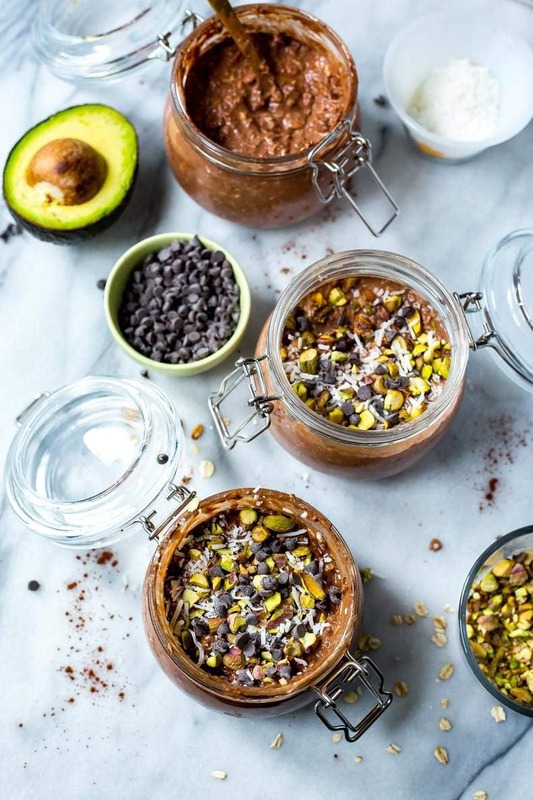 I'm telling you, with back to school starting and everything getting so hectic, these Chocolate Avocado Overnight Oats Jars are going to save you on weekday mornings. Or they may just be the perfect little indulgence on a weekend when you don't feel like cooking. Your call! I mean, just look at that big spoonful of chocolaty goodness and tell me you don't just wanna dive in. 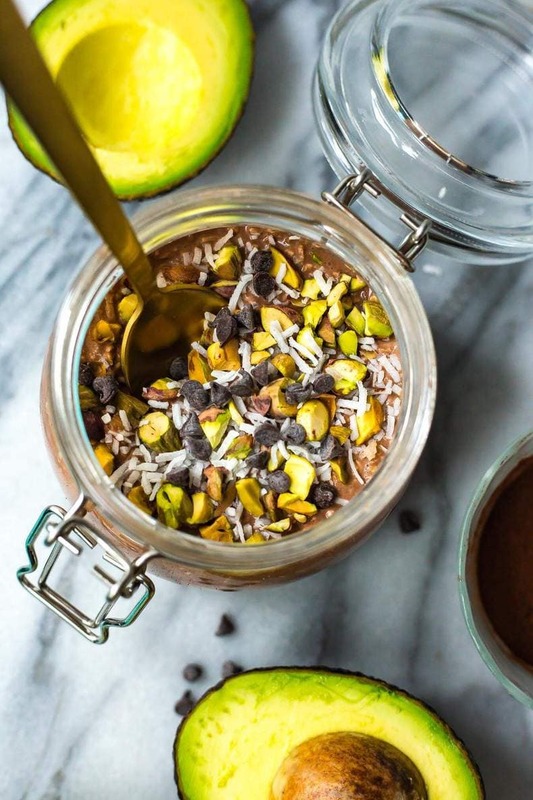 Let's get to the nitty gritty of these Chocolate Avocado Overnight Oats. First off, there isn't really any real chocolate in here so you don't have to worry about eating actual chocolate for breakfast. Cocoa powder is seriously amazing, and it's my secret hack for that chocolaty flavour without the guilt. 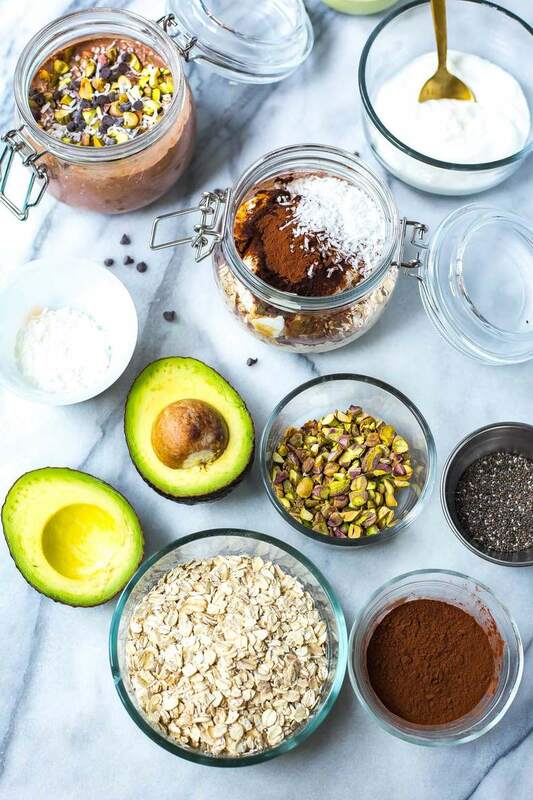 Mix that together with some milk of your choice (dairy or non-dairy, I'm obsessed with coconut milk so I used a bit of that) along with some Greek yogurt (optional if you wanna make this vegan, just sub in more non-dairy milk) and add in the oats and avocado. YES, there's real avocado in here!!! Seriously! 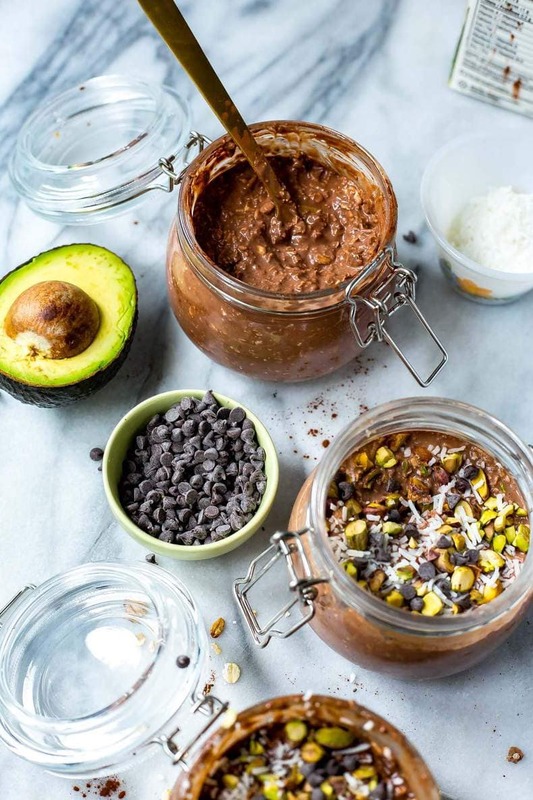 These Chocolate Avocado Overnight Oats Jars are the perfect thing to make when you bought too many avocados and have let them start to go bad, or let's face it, if you're like me and you only really like them when they've got the perfect amount of firmness and you're using them sliced up in salads or in salsas. I can eat 'em all mushed up in guacamole but besides that, I don't really know what to do with avocados that are less than perfectly ripe. I'm the same way with bananas and tomatoes. I need them super firm and just barely ripe. So sad that I feel that way as a food blogger ehh? Aren't I supposed to like veggies all types of ways?! 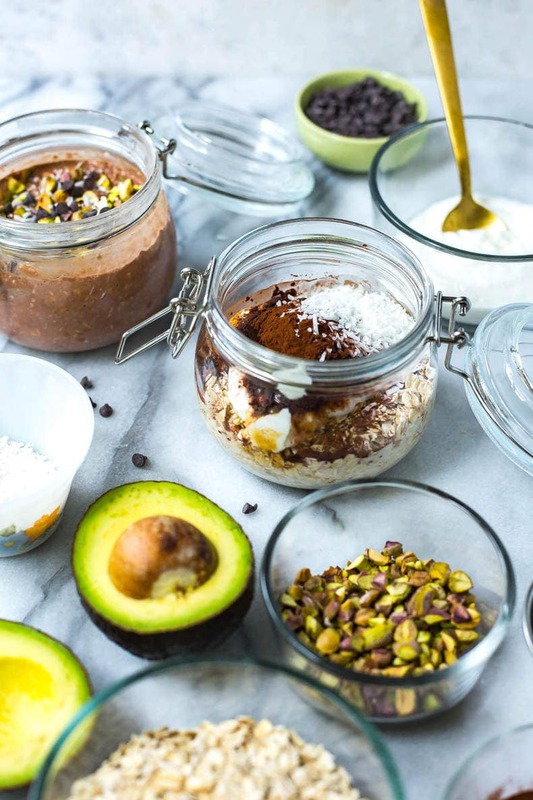 Well, being the picky avocado eater that I am, these Chocolate Avocado Overnight Oats Jars are the perfect solution to reduce my food waste and solve my breakfast dilemma each morning. Did I also mention that they're the perfect grab and go breakfast for you to take to work? I make about 3 of these at a time and am set for at least half of the work week anyway. 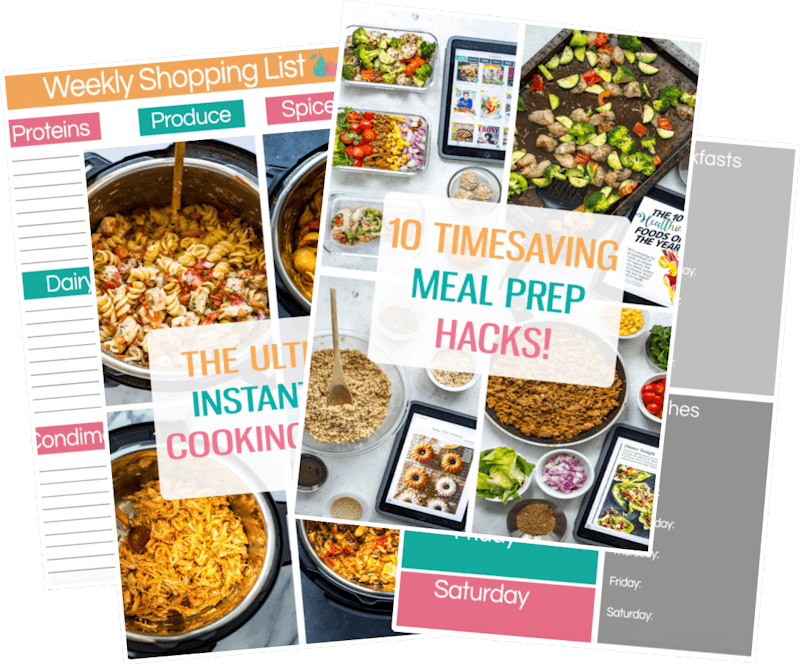 No more rushing around and forgetting to eat or grabbing a 500 calorie muffin that's gonna leave you hungry again in just a couple of hours. Power breakfast, we got this. 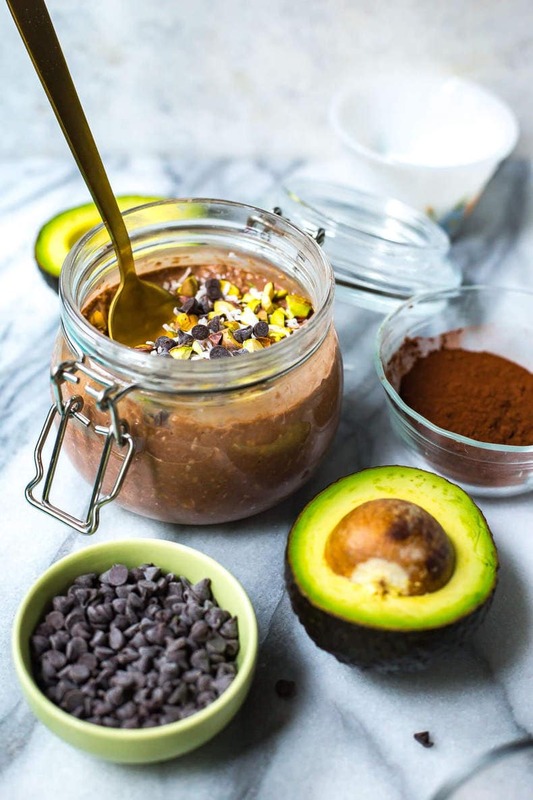 Will you be making these Chocolate Avocado Overnight Oats Jars? Mash avocado and mix all ingredients together except for garnishes. 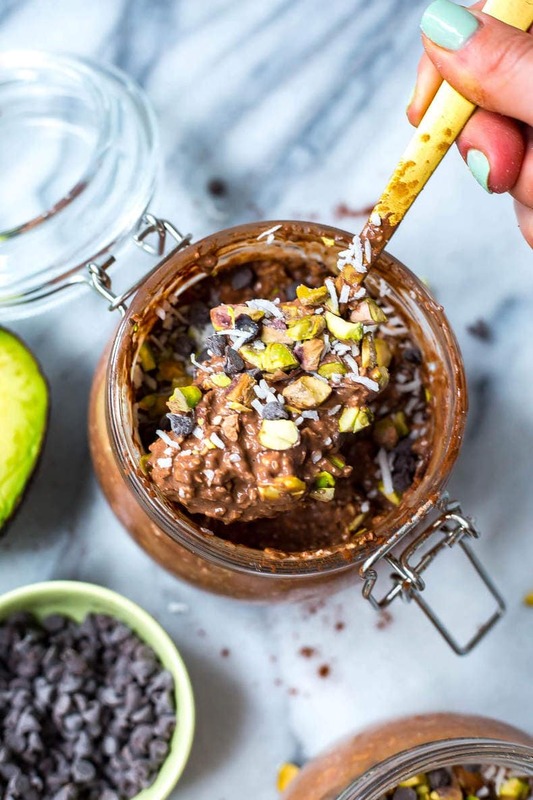 Divide among four jars and top with pistachios, shredded coconut and chocolate chips (all optional garnishes but makes it taste super yummy!) Let sit at least 2-3 hours before serving and enjoying! Hi! 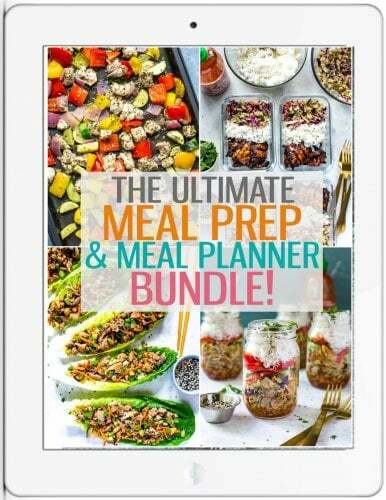 Is it necessary to add in the Chia seeds? Thanks. Hi Taylor! Can’t wait to try this!!! How long will these stay good in the fridge? Could I make the entire work week in advance?